This blog is the first in a two-part series that will talk about how the characters in Fragments of Him took shape and were given life. In the next blog I want to tell you more about the processes we tried, and which we finally used, to create the character poses and animations to tell the story. Our goal was to tell a compelling story that we could bring to market, and we knew from the beginning that this would be a challenge with a core team of three and limited resources. While I am not an expert on character development or motion capture, we had to deal with both to tell the story that we felt needed to be told. These constraints drove many of our decisions moving forward. Several years ago Fragments of Him saw the light of day after a 3 day game jam. It became a short story with crude environments and a single faceless static character pushed into poses with single solid hues to indicate different characters. Considering the time limitation during which this prototype was made, I think that we did a decent job in conveying a story using abstract characters in simple poses. It has moved many players to tears both online and at conferences around the world. If you haven't played it yet and have a browser that still supports the old Unity Web Player then you can play the 15 minutes story here. When we talked about taking Fragments of Him to the next level, one of the challenges we faced was evolving the characters and their representation. As the environments became more detailed, so did the characters. It was important for us to stay out of what is known as the Uncanny Valley. In a nut-shell, creating realistic and believable characters is incredibly hard. If not done right you run the risk of characters that don’t look quite right and appear more creepy than likeable. Lacking the resources to tackle this issue, we chose to avoid it by giving our characters an appearance that lies between face and faceless. Our core team did not have a lot of experience with character development, rigging, or animation and we were fortunate to have been able to work together with talent that enabled us to dive into this area. As with the prototype, the core experience relies heavily on its narrative. For us, this meant that while the story's writer, Mata Haggis, was shaping the story and its characters he was also continuously providing us with biographies, descriptions, and image references to help us start the journey to creating the 3D models of the cast. With the script taking shape we realised that certain locations and story points needed more characters than we had the capacity to produce. We took different approaches for the main cast and what we call the 'filler characters'. First we will look at the main cast consisting of Will, Sarah, Mary and Harry. After that we will take a brief look at the choices and development of the filler characters. We needed to begin shaping how our cast would look. Starting from the information and references that Mata provided us with, the next step was to create thumbnails for each of the characters. These thumbnails gave us a good impression on the readability of each character and it gave us a lot to talk and think about before even opening 3D modelling software. Silhouettes, contrast and highlights already tell us a lot about these figures. If none of the thumbnails got close to Mata’s vision of the cast we would have to keep creating thumbnails until we get to a design that fits the story. The next step in the process is to add more detail and steer the character’s development along the way. We had many meetings with Mata to get iterative feedback, making sure that the details were matching the people, their tastes, and the year that each scene was set in. Before moving on with talking about the general development of the characters I would like to explain more about our decision for the character's faces. When we created the prototype we were very concerned about how players were going to relate to the characters in the story and despite using the same character model with only a single colour differentiating one character from another, it didn’t seem to matter for the delivery of the story. More interestingly, players mentioned that they related to these characters in ways we could not foresee. Comments like this gave us the notion that we could tell a good story while leaving the faces impressionable enough for players to project their experiences onto the cast. Furthermore, while we would love to dive into the interesting challenge that is face design, modelling, rigging, and animation, we knew that it would take far more time and resources than we had available. Knowing that the limitations of a small studio meant we couldn't do detailed faces, we were still exploring how we would actually deal with it. Some of these character progress shots show examples of where the faces turned out to be more detailed than looked comfortable. You might think that these faces look fine, but when their facial expressions don't change throughout the game it can look rather creepy. For each character to be believable we spent a lot of time on getting the character's body proportions to be in line with the world's vision. Mata's vision of Fragments of Him is based in reality, and all body types are different, so equally we didn't want a generic male and female body to apply clothing to. The four characters are of different heights, ages, and weights. This diversity adds significantly to the believability of them as people and helps the players get emotionally invested in these characters. For us, the extra effort was worth it. Each of the character's had carefully picked outfits to match how they were portrayed within the context of the story. An outfit can say a lot about a person. As with any artist, we gathered, discussed, and used a lot of reference material to help us move forward. When working on Sarah we realised that having a solid mesh for hair, as with Harry and Will, did not achieve the look we were going for. The hair took us several attempts to arrive at a solution that looked acceptable. Some of the hair solutions we tried looked amazing but were difficult to modify for the character fading effect we use. Here is an internal development video discussing some of the fading effects for objects and characters. It shows how the popping of the hair was a problem. Ultimately we used Unity's Standard Shader to do the hair in combination with alpha maps to get the consistent look and fade effect that we were after. Many months and iterations later we arrived at the current cast that you see below consisting out of many different outfits for the various points that make up the story. does not require any uv-unwrapping. hides the low polygonal detail. At several points in the story the main cast is accompanied by family. These support characters don't say anything, but are certainly present in the story and are specifically mentioned to be related to the main cast. The filler cast ended up using a solid colour with several low-poly meshes where the silhouette and animations, in combination with story ques, provided enough information to fill in the blanks on who these characters were and what they represented without looking too much out of place. In the case of the filler characters we could make use of animation re-targeting techniques to provide a range of characters with the same animations. Filler character experiment and animation re-targeting. The release trailer has a shot where the filler characters can be seen in the background. These figures are not too distracting but form a nice and diverse volume of characters to make up a crowd of nondescript people. While in the process of creating the shading style, Mata requested that we include variation in the greyscale tones of the filler characters to hint that the wider world of Fragments of Him features more racial variety than the solely white cast. As the narrative designer for the project, his focus has been on creating an emotionally engaging experience within the scope of the team. There are huge individual differences all around us in the real world, so hinting at this variation through the fillers' shading, on top of the existing different combinations of clothing and hair, improved the believability and increased the narrative immersion. It also had two distinct visual benefits: the filler characters felt less obviously cloned, and their silhouettes were easier to distinguish in crowd scenes. Throughout the process of developing these characters we explored a virtuous cycle of individuality, believability, and visual style. Each element was weighed in the workload requirement and the benefits they delivered, always with the goal of supporting the narrative setting and storytelling. If we did our job well then you probably never noticed many of these details, but instead intuitively accepted them - that's the sign of a believable virtual world! In conclusion, this article talked about the creation and development challenges pertaining to the characters and cast of Fragments of Him. There is much more that I would like to share about this title and I hope that this article at least gave you an idea of some of the choices and difficulties that we faced and how we decided to move forward. In the next article I will discuss characters a bit further and from the perspective of character animation: how we tackled this with a very small team, some of the things we tried, and what we learned along the way. The characters that you see in this blog were almost entirely created by Baiba Gedrovica and Kaylee Mulder. Please check out their portfolios if you are in need for great game artists! Proof reading and additional editing has been done by Mata Haggis. The core team behind Fragments of Him is Mata Haggis as writer/designer, Elwin on programming, and myself as art director and asset production. Elwin and I are the co-founders of Sassybot and Mata, while being instrumental in this project, is his own entity and currently employed as an associate professor at NHTV University in Breda. Along the way we have received invaluable help from partners, collaborators, friends, and family to realise the vision of Fragments of Him. My eternal thanks and gratitude go out to those who have helped us make this happen. 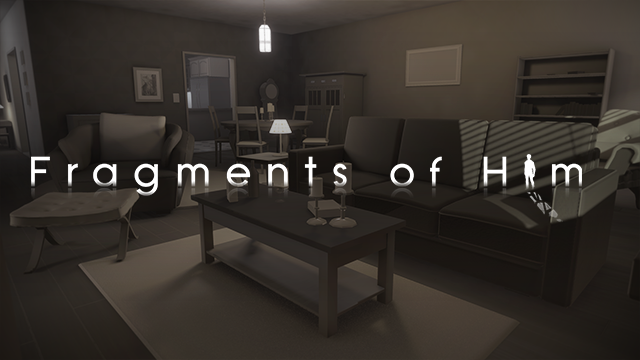 Please support us by grabbing a copy of Fragments of Him on Steam and Xbox One and help us bring this story to PlayStation 4.